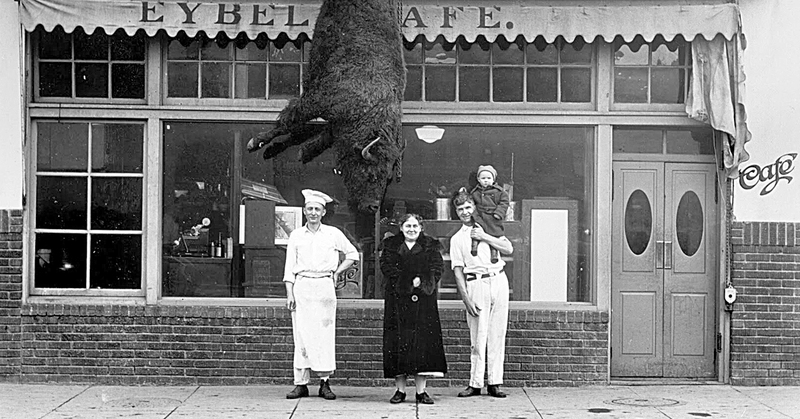 Jennifer duToit fell across this historical Helena photograph of the Eybel’s Cafe when she was working at the Business Improvement District/Downtown Helena Inc. office last winter. “I don’t know a thing about it—I just loved it,” she said. Interpretive Historian Ellen Baumler from the Montana Historical Society was able to give us a little insight on the image. Eybel’s Cafe was located on Helena’s Last Chance Gulch, where The Painted Pot stands today. Constructed in 1922, the cafe was famous for its homemade pies and catered especially to the town’s single residents, as noted on the National Register sign detailing the building’s history. Baumler said the Eybel family had been a Helena institution for many years and ran a hotel on Fuller Street as well. “It was more of a rooming house with furnished room, and they had many longtime lodgers,” said Baumler. The family’s first business was located over on Railroad Ave., which today is Hap’s bar. Hap’s was a known speakeasy during Prohibition, and Baumler suspects the Eybels may have run a clandestine operation there themselves when it was under their ownership. “Just speculation on my part,” said Baumler.